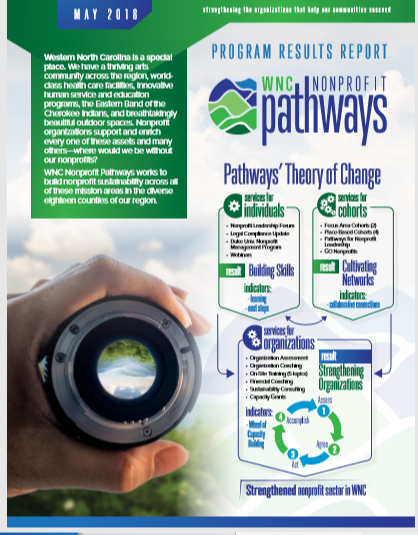 At WNC Nonprofit Pathways, our mission is YOU. Nonprofit organizations form the backbone of communities across the mountains of Western North Carolina. We are here to help your organization become stronger and sustainable so that you can fulfill your mission. Do you like numbers? Or stories? Whichever you prefer, Pathways’ 2018 Program Results Report offers a great way to learn more about the work we do and the results that organizations are seeing from focusing on their own capacity. Dive in! Click on the image to view the 2018 Program Results Report. We invite you to find the right path for your organization. Learn about what we offer, ask questions, and get involved. Can’t find what you need? Use the search box below. If you have any difficulties with our event calendar, please contact us by email at contact@nonprofitpathways.org. Begin at the beginning and learn the basics of project and program evaluation in a safe, fun environment. This workshop combines teaching with small group discussion to provide a “nuts and bolts” introduction to practical methods for conducting evaluation. During this interactive session, you will learn the “what, why, when, and how” of evaluation including key stakeholders’ roles in evaluation, the utility of theories of change, how to design an evaluation plan, and basics of data collection. By the end of the day, you’ll have created a brief action plan for addressing evaluation in your organization for the future. This course is taught by Jill Fromewick and Emily Kujawa. Click here to register for this course. Use course id 0078-011 when registering. *Please be sure to use an active email address when registering. We will be sending important class information that you will need. WNC Nonprofit Pathways is pleased to welcome Ed Chaney joining us for the first time to present the 2019 Nonprofit Compliance Update. The afternoon portion of the workshop will include a deep dive into Diversity, Equity, and Inclusion in Human Resources with Lakesha McDay. Lakesha McDay’s session, “Transforming the Workplace Through Intentionality”will round out the afternoon with a focus on diversity, equity, inclusion, and human resources. Diversity and inclusion are not only right, but also a winning growth strategy for any organization. Diversity and inclusion drive engagement, innovation, and creativity. The “how” is critical to achieving successful outcomes in creating a welcoming and inclusive workplace. We will discuss useful tools and strategies to begin to move your organization further on the continuum of Diversity, Inclusion, and Equity. Click here to register for this event. Doors will open at 9:30 am. Fundraising is about more than money; it is a process of bringing together vision, targeted strategies and supporting systems that build lasting relationships with donors and enable them to make a positive difference on issues they care about. This course addresses the most effective and successful methods of raising money. It focuses on proven activities that will strengthen your fundraising program and results. Learn current trends and best practices in annual giving, retaining and upgrading current donors, prospecting new donors, engaging volunteers, and managing the fundraising process. You will be guided from “the ask” to “the acknowledgement” and will gain specific ideas to enhance your fundraising results. This course is taught by Angela Kemper. Click here to register for this course. Use course id 0812-056 when registering. Nonprofit Boards of Directors are often viewed as a necessary evil when in fact the opposite is true – they are a “necessary good”. As a former Executive Director, instructor Allison Jordan understands the value of the Board of Directors. Learn tips and tools to actively engage your Board in governance and fundraising and start creating a strong Board foundation. This class is best for those currently working with a Board of Directors. Click here to register for this course. Use course id 2543-002 when registering. What do these words have in common? They speak to a vibrant volunteer culture; do they describe your organization? Discover how building a culture of volunteer engagement for your nonprofit increases organizational capacity. Learn best practices of skill-based volunteering and other trends. What could you do if you had all the resources your nonprofit needed? This class is designed to actively engage and involve the participants as learners and as contributors. This course is taught by Tracy Davids. Click here to register for this course. Use course id 2540-004 when registering.